by Kelsey Kinser. It’s not news that I’ve been trying to incorporate a few more vegetarian and vegan meals into my diet, so when I was asked if I wanted to review this book, it was the perfect fit. This book is packed with recipes, and they are good, delicious sounding recipes. African Curried Black-Eyed Pea and Coconut Soup anyone? What about Valencian Minted Fava Salad or Curried Dal with Cauliflower? The book doesn’t have any pictures, but for some reason, I really don’t miss them. I think it’s because the recipes all sound so amazing that I don’t need a photo to convince me to try them. I’m often cautious about vegan cookbooks because I find that a lot of the time they use ingredients that I don’t readily have available in my kitchen or at my grocery store. This book doesn’t really use any of those unusual ingredients and that’s why I love it. I can see myself making a ton of recipes out of here over the summer. I highly recommend this book if you’re looking to cook more with beans! 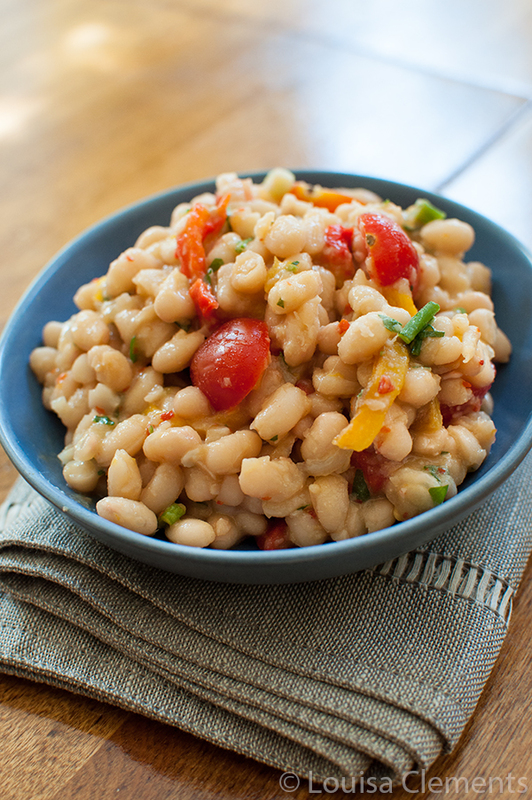 This recipe for Argentine White Bean Salad has such a great balance of flavours, it’s smoky, spicy and the roasted red and yellow peppers add a nice sweet touch. The fresh parsley and green onions give it a nice crunch and some brightness. This is the sort of salad I would bring to a potluck or serve to company, it would also make a great lunch to take to work. Steak houses are common throughout Argentina, and although this book is a decidedly steak-free tome, this powerful white bean salad is more than welcome in any vegan (or non) cook’s repertoire. This salad is strong enough in both flavor and its ability to fill you up to take the center stage of any dinner party. If you can find the Argentinian pepper aji molido, feel free to use it, or partially grind red pepper flakes for a similar spice. Place the whole bell peppers on a tin foil–lined sheet tray and bake for 30 to 40 minutes, or until the skins of the peppers are thoroughly charred and very wrinkly. Flip the peppers every 10 minutes to ensure even roasting. After the peppers are ready, cover them tightly with aluminum foil and allow them to cool enough for you to be able to handle them. Remove the stems and halve the peppers. Peel off the skin and scoop out the seeds. Discard these. Julienne the roasted pepper flesh and set aside. During the same time place the beans, liquid smoke, and onion into a medium-sized pot and cover with water by an inch. Bring to a boil on medium-high heat, cover, reduce heat, and simmer for 11?2 hours. The beans should be tender but not mushy. Drain the beans but reserve 1 cup of the cooking liquid. Cook down this reserved liquid until it is thickened. Stir in the garlic, pepper flakes, salt, vinegar, Dijon, and olive oil. Remove from heat. In a large bowl, toss together the beans, green onions, peppers, tomatoes, seitan, parsley, and seasoned cooking liquid. Serve. Recipe published with permission from Ulysses Press. 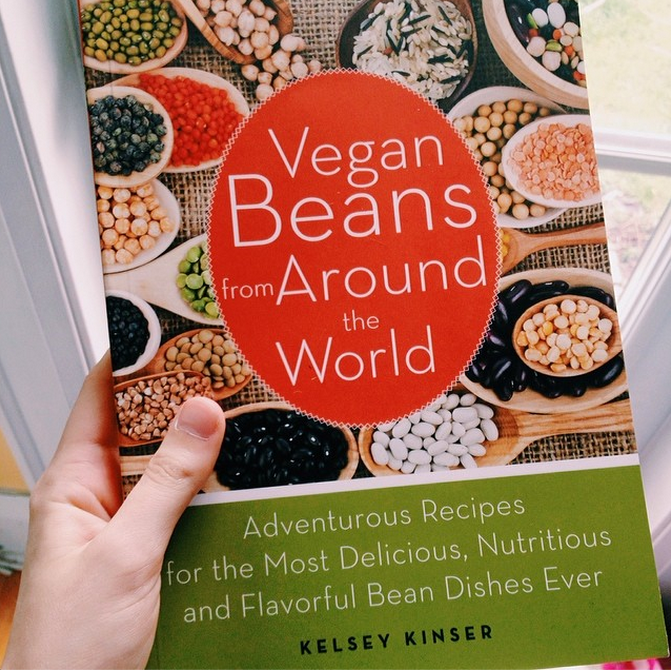 Disclosure: I was sent a copy of Vegan Beans From Around the World: Adventurous Recipes for the Most Delicious, Nutritious and Flavorful Bean Dishes Ever by Kelsey Kinser to review by Ulysses Press. The decision to write about this book is completely my own. I was not compensated in any way for writing this post. This post contains affiliate links, thank you for supporting Living Lou!